When teeth are extracted, the body works quickly to heal itself. Gingival tissue heals faster than bone, and sometimes the soft tissue fills the socket before the bone does and leaves a bone deficiency. 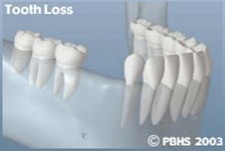 Occasionally, because of the amount of bone lost around a tooth already, preventing further bone loss at the time of tooth removal is advantageous. Through the use of a resorbable membrane, and sometimes the addition of bone, it is possible to keep the gingival tissue out of the socket to allow the bone to fill in instead. 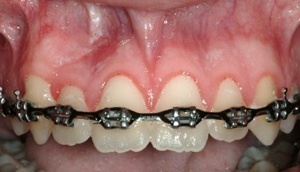 This will allow a proper bony foundation for future implant placement. It is usually necessary to allow at least 3 months for healing of the socket before an implant can be placed into the area. There are several surgical options to enhance the cosmetic appearance of one's mouth. 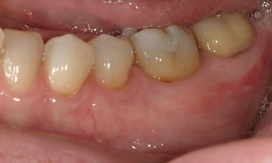 These include procedures to cover exposed roots due to gum recession, cover exposed metal margins of fillings or increase the thickness of thin gingival tissue, procedures which alter the contours of the gingival tissue in order to even out the smile line, or procedures used to reduce bulky gum tissue that is un-esthetic. There are a number of operations that can be performed to enhance the appearance of the gingiva to produce a more balanced and harmonious smile. 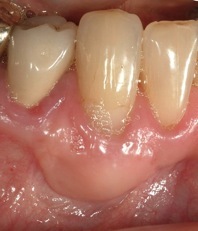 Gingival grafting is one of the more common procedures. 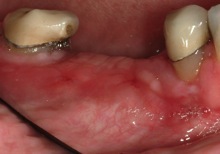 There are two types of gingival grafts: a free gingival graft, and a connective tissue graft. 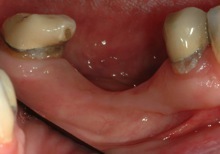 The type of graft taken depends on the type of gum defect present as well as the purpose of the graft. Some are used for bringing the tissues back to a healthy state and in preparation for crowns or fillings that a dentist will place. Others are used for esthetic reasons simply to improve the appearance of one’s smile. 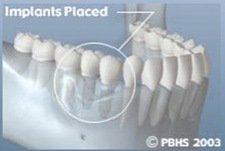 Additional reasons for grafting include discomfort in the gums during tooth brushing or eating, to repair shallow root decay or root wear from aggressive tooth brushing, to prevent recession because of orthodontic tooth movement (although sometimes orthodontic treatment itself can repair recession and no grafting is needed), and to facilitate self-performed plaque removal. Before and after pictures of patients of Dr. Nicoara’s who have received these two grafts are presented below. When initial conservative therapy in the form of scaling and root planing does not resolve the deep pockets, surgical intervention is necessary to eliminate these pockets. One way to do this is to cut away the excess gum tissue and expose the underlying bone to level out the areas of bone loss. 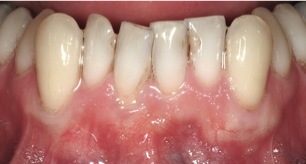 Once the gum tissue heals back to the bone, the pockets are reduced to a level which can be maintained through normal brushing and flossing, usually 3mm or less. 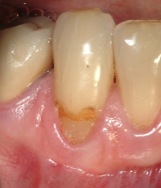 As a result, more of the root surfaces of the teeth are exposed. Sometimes sensitivity to very hot or cold foods develops, but usually resolves on its own. This type of surgery is usually reserved for the teeth in the back of the mouth where esthetics is not as important as in the front of the mouth.  Surgery in general requires the use of local anesthetic to numb the area to be treated. In addition, if you are particularly fearful or anxious, oral medications can be prescribed to relax you even further. These medications are similar to sleeping pills. They can also effect a level of amnesia so that you may not remember every detail of your appointment. If you are prescribed one of these medications, you must have someone drive you to and from the clinic on the day of your appointment. If IV sedation is required, an anesthesiologist can be called in to supervise your sedation. You can learn more about Dr. Aubrey Carter, our anesthesiologist, on the Meet Us page of our site. Feel free to bring an iPod if you’d like. Stitches will usually always be placed, and if they are not the resorbable type, they will need to be removed usually within one week. Sometimes stitches are left in the mouth for longer periods of time, and you will be informed whether this will be necessary or not. You will also most likely be prescribed a special mouth rinse to keep your mouth clean and prevent infection for the first week after surgery since you will not be permitted to brush or floss the surgical area or the stitches. Sometimes an antibiotic is also prescribed depending on the situation. Advil (ibuprofen) is recommended for pain control, and occasionally a stronger pain medication will also be prescribed. Other medications you may be prescribed include an antibiotic to prevent infection, or a steroid to help reduce significant swelling. Further instructions and specific directions regarding the types of foods you may consume after surgery, and the medications you may be prescribed following the surgical therapy, are located in the Patient Information Page under the Online Forms section at the bottom of the page. Click on the Post-Surgical Instructions link, or you may click here to be directed to this information now. Also, all of the cases presented are patients of Dr. Pamela Nicoara. Sometimes the pattern in which the bone is lost around a tooth is such that cutting away the gums and smoothing out the bone defects is not the best treatment option, and a regenerative approach, rather than a resective approach is recommended. Guided Tissue Regeneration rebuilds the previously lost bone and gingival tissue surrounding a tooth. 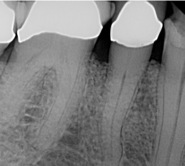 Most techniques use membranes, which are placed over the bone defects around the teeth. Some of these membranes dissolve away and some require removal.  Other regenerative procedures involve the use of bioactive gels. Besides a membrane, hard bone tissue may also be used to regenerate lost bone. The bone used as a graft is either taken from your own body or from an outside source. If it is taken from your own body, it is either in the form of shavings or a block of bone from within your mouth. If it is from an external source, it is sterilized bone usually taken from a cow or sometimes taken from a pig. 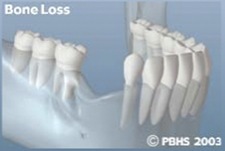 The photos below demonstrate bone loss around the side of a tooth. The defect was filled with bone graft, and then the membrane covers over it like a blanket. 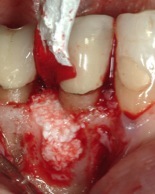 Then the gum is stitched back over the bone and membrane.  The x-rays beneath show before the graft where the bone is missing, and after the graft is placed. 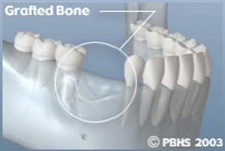 Bone is also lost when the teeth are lost or removed, as shown in the diagram below. Guided Bone Regeneration can be used in these areas to prepare the site for a tooth-like restoration such as an implant. Sometimes grafts are done at the time of tooth extraction, and sometimes they are performed at a later visit, depending on your clinical situation. In the case photographed below, the patient had been missing her teeth for many years. The bone slowly resorbed away. A bone graft was done, and covered with a titanium reinforced membrane and tacked into place (you can see the shadows on the second x-ray). 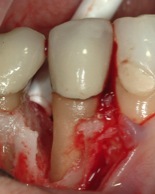 The membrane stays in place to help the bone to heal separate from the gum. It is removed after 6 months of bone healing when the implants will be placed. Dental implants are metal screws made of titanium (the same material used in hip and knee replacements) which are placed into the bone to replace a missing tooth or a group of missing teeth. Titanium has been shown to make a special bond with bone called osseointegration. It takes at least 6 weeks for this process to be completed so that the implant is integrated to the bone. After osseo-integration, then the crown or bridge, or even a denture, can be fitted to the implants so you can begin to chew and function with them. Sometimes it takes longer than 3 months for the implant to integrate to the bone, depending on the quality of bone that the implant will be placed into, or if there is a bone graft placed at the same time. 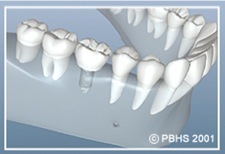 You can find complete information on dental implants on the Dental Implants page. Clinical crown lengthening is a surgery that is often necessary due to advanced decay destroying so much tooth structure that there is not enough left for your dentist to restore it with a properly fitting filling or crown. The same situation can develop when a tooth has been broken, again leaving insufficient tooth structure to be able to repair it. The crown lengthening surgery removes gum tissue and bone to expose sufficient tooth structure for it to be restored. Typically it is necessary to wait approximately six weeks for the gum tissue to heal and mature before you will be able to see your dentist for the new crown or filling. The ‘before and after’ photos of patients of Dr. Nicoara’s are provided to give you an idea of the results you can expect. Oral pathology relates to any abnormal changes that occur to the tissues inside of your mouth. These tissues are normally coral pink in color and of a uniform thickness and texture. Suspicious changes include any lesion that is significantly red, white or blue in color, raised or ulcerated in dimension, does not resolve in approximately 2 weeks, and may or may not be painful. The pathology can include a diagnosis ranging from oral cancer due to excessive tobacco or alcohol consumption, a genetically mediated autoimmune disease like lichen planus or burning mouth syndrome, simply an allergy to a food or oral care product, or finally a normal variation in anatomy. Please do not ignore suspicious lumps or sores in your mouth, and let us know so that we can help you. Sometimes, based on the biopsy diagnosis, a referral to another specialist is necessary. 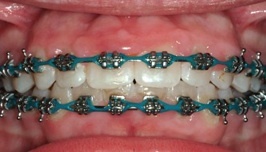 There are a variety of procedures which are most commonly, but not always, associated with orthodontic treatment. They include frenectomy, gingivectomy, or uncovering of a tooth which is delayed in its eruption into the mouth. 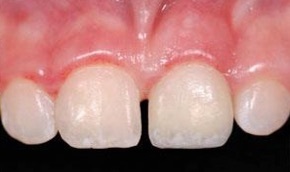 Crown lengthening can also be performed as a cosmetic procedure to make short teeth look longer, to obtain a more pleasing appearance, or to treat a ‘gummy smile’. Click here to read Naomi’s testimonial. Occasionally, if there is not enough of your own tissue available in the roof of the mouth because of the number of teeth needed to be grafted, or because of a ‘gag’ reflex, it is necessary to use a donor tissue from another human source. This tissue is called Alloderm. One advantage is that there are no incisions in the roof of the mouth, which is usually the area causing the most discomfort during healing. However, stitches do remain in place for one month, and food restrictions are more stringent with this type of graft.  You can learn more about Alloderm by visiting their website. 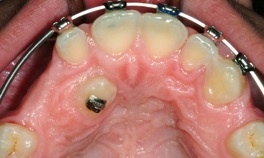 The result of a patient of Dr. Nicoara’s is presented below. The maxillary sinuses are behind your cheeks and on top of the upper teeth. They are large, empty spaces lined with a membrane of tissue. Some of the roots of the upper teeth naturally extend up into the maxillary sinuses. 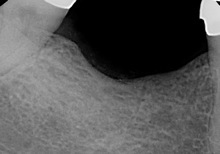 When these upper teeth are removed, there is often just a thin wall of bone separating the maxillary sinus and the mouth. 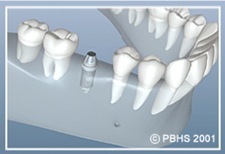 Dental implants need bone to hold them in place. 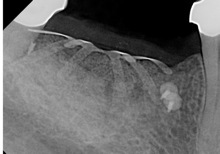 When the sinus wall is very thin, it is impossible to place dental implants in this bone. 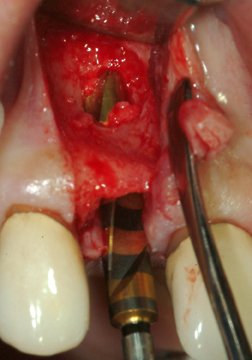 The solution is a graft to lift the sinus membrane away from the tip of the dental implant to be placed in the area. The surgeon enters the sinus from the side where the upper teeth used to be. 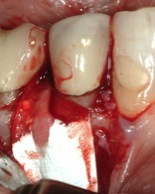 The sinus membrane is then lifted upward and donor bone is inserted under the membrane. 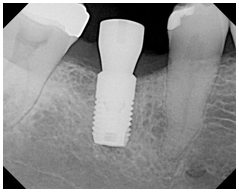 Often, the implant can be placed at the same time. If there is too little natural bone to stabilize an implant at the time of grafting surgery, the graft is allowed to heal at least 6 months before attempting to place the implant at a later date. After several months of healing, the grafted bone becomes part of the patient’s own bone and dental implants can be inserted and stabilized into this new sinus bone. The frenum is a piece of tissue which connects the lip to the gums. 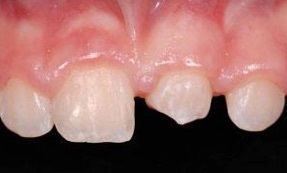 Sometimes it is unusually large or thick and can extend in between the two front teeth keeping them separated. 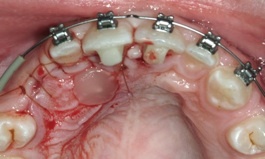 This frenum can be easily removed, and helps to prevent relapse of an opening between the teeth after orthodontic therapy has moved the teeth in contact with each other. 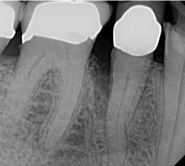 In the photos to the right of a patient of Dr. Nicoara’s, the teeth have moved together on their own after the frenum was removed. Orthodontic tooth movement follows Newton's third law: every action has an equal and opposite reaction. In some cases, it is advantageous to prevent the 'opposite' reaction. Anchorage is a means to prevent unwanted 'opposite' tooth movement by using an immovable object (a temporary anchorage device) to move only the teeth you want instead of all of the teeth against each other. Temporary anchorage devices, or TADs, come in the form of simple screws, or surgically placed plates in the bone. Below are a few examples of the TADs that Dr. Nicoara can place for you. 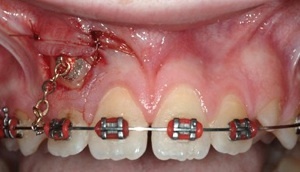 The orthodontist for the mini-screw case was Dr. Terry Sullivan in Mill Creek. 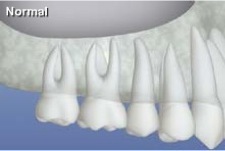 Many times a tooth may be tilted in a position that prevents its normal eruption into the mouth. The tooth can be uncovered and a gold chain glued to the tooth in order for the orthodontist to start pulling the tooth into the proper position in the arch (Case 1). When the tooth is in the roof of the mouth, the tooth will be uncovered, but a spacial bandaide will be placed over the tooth to allow the tooth to slowly erupt into the mouth on its own for several months before the orthodontist starts pulling on it (Case 2). 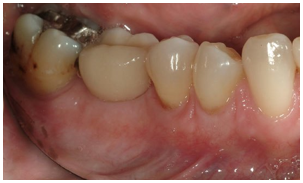 Although the surgery is completed in about an hour, the time necessary to pull the tooth into the proper position can take as long as three years depending on the position of the tooth, as it did for these patients of Dr. Nicoara’s below. 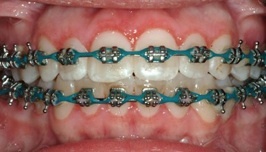 The orthodontist for these cases was Dr. Michael George in Everett. Tooth autotransplantation is the surgical extraction of a tooth from one location in the alveolus, and implantation at a different position in the ridge. 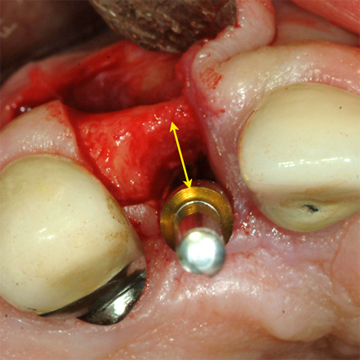 A variation of this is called transalveolar transplantation where a tooth that is severely malpositioned in the correct tooth area is surgically uprighted into a more ideal orientation (see a powerpoint presentation here). 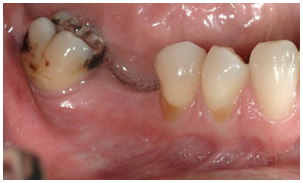 Tooth autotransplantation in humans was first reported in the literature by Bjercke and Slagsvold in 1959, and can be used to replace any missing, malpositioned, or damaged tooth. It is a most powerful tool for bone regeneration when immature teeth are transplanted (for example, to replace a tooth and bone in areas of missing teeth and cleft lip), but mature teeth can also be used in certain situations. You can read more about this in our Autotransplantation ProbeTips newsletter. Below is an example of moving a premolar from the lower jaw to a missing front tooth in the upper jaw in a 10 year old boy. This is particularly useful since implants are not available until growth has stopped at age 18 or 20. The transplanted tooth can function for many years, and may even prevent the need for an implant in the front tooth position in the future. The images below are courtesy of Dr. Jim Janakievski and Dr. Gregg Kinzer. purposes. For Dr. Nicoara’s patient below, the gums were enlarged due to irritation from the orthodontic brackets in conjunction with poor oral hygiene. 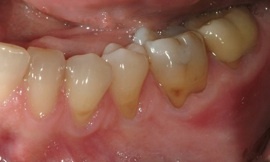 After the gingivectomy, the patient must be diligent about brushing and flossing regularly in order to prevent the gums from overgrowing again. In addition, a bioactive gel called Emdogain may be used as a ‘fertilizer’ to help the bone heal against the tooth and rebuild the lost tissues which do not easily form on their own. More information on Emdogain is available here.